How to add volume to hair. Beautiful women want more volume in their hairstyles. Creative women know how to do it. Adding volume to short hair is very easy. 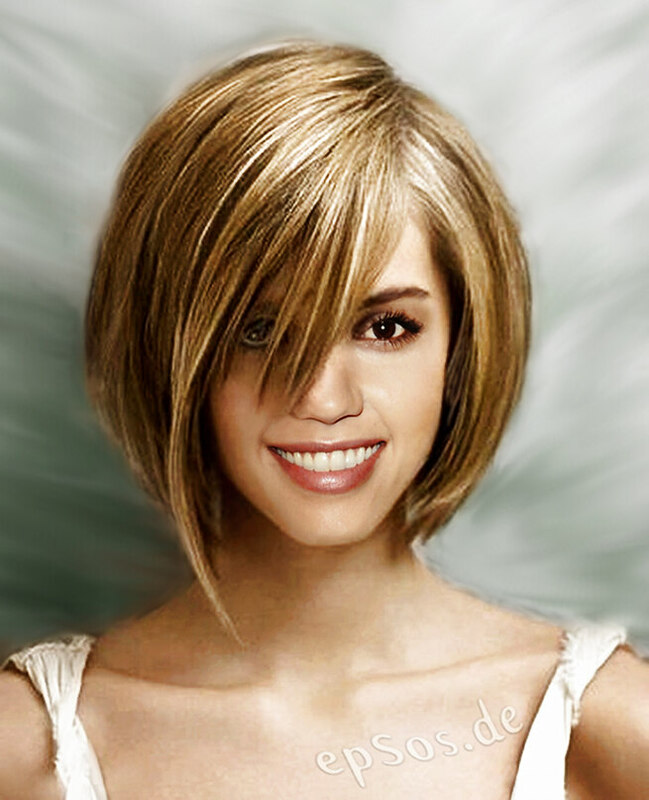 The attractive volume can be created with any style of the short hair. Good hairdressers use a soft, round brush and natural products for adding more volume to the short hairstyle. You can do it too ! You can use natural aloe vera gel, a natural hair cream or liquid bee wax and hair spray after the shower. Apply the beauty product on wet hair. Take a soft brush and start to create beauty. Brush the wet hair from the inside to the outside. Continue brushing and dry your hair with a cool air from the fan or an electronic dryer. Be patent with your short hairstyle and very patient when you have long hair. Use cold air, because hot air will damage the hair and make it very dry. How to create curly hairstyles. Curly hairstyles are very easy to make. Wise women use curly hair to attract beautiful men that are good for them. Even the short hair of women can become curly. Wash your hair with a shampoo that contains protein. Or mix one egg into the shampoo and wash your hair with it. Wrap your wet hair around the soft sponge rolls and fix it with an elastic band. Small sponge rolls will create small curls. Big sponge rolls will create big curls or soft waves in the short hairstyle. The soft sponge is very good for the curls, because they are light and help the wet hair to become dry faster. Keep the sponge rolls in the wet hair. Apply liquid bee wax or natural hair spray with Aloe Vera on wet hair. The spray will make the curls much stronger. Or just use nothing, if you want your curls to be very soft. Dry the wet hair with cool air and remove the soft rolls from the hair. You can remove some of the curls in your hair, if you do not need them. Wet your hands and stretch the curls that you want to remove. You can also stretch all curls, if you want them to become softer. Soft curls in the short hairstyles help young women to attract more attention. You can use those beautiful curls to gain respect from other women. Be wise and careful. How to create shiny hair. Shiny hairstyles can be very easy. Wise women need to protect their beautiful haircuts from the strong sun and heat, because the heat can damage the soft hair and make it very dry. Natural oil products can make the short hairstyle very shiny again. Avoid strong chemicals as much as possible, because the chemicals are an enemy of the shiny hairstyle. Use soft and natural ideas from epSos.de instead. Use a soft brush for your beautiful haircut. The soft hairbrush will prevent damage and make the female hair as smooth as olive oil. A natural shampoo with eggs or protein can help the short hairstyles to become more glossy. The protein will protect the sensitive hair and make it very shiny. Creative women can use natural oil products for their short hairstyles. The oil must be very smooth and very soft. Sticky oil is bad. The oil must allow the hair to be free and soft. You will have to try different products before you can find the best natural oil product for your own haircut. Remember that the oil must be used at the tip of the haircut, because the oil on the skin of the head can create skin problems and make the head very itchy. Too much oil is also bad. Some women do not like the natural oil on their precious hair. Those women use the gel of Aloe Vera to make their beautiful haircuts more shiny. You can use the natural gel of Aloe Vera on your own wet hair. Remember to polish the wet hair between your fingers or brush it with a soft brush. Use cold air to dry the long hairstyles faster. Avoid hot air and hot water on your sensitive hair. Use cool air and mild water instead. Remember to eat the food that has more vitamins and fresh ingredients. The healthy food will help to grow healthy hair with strong colors.